Nice big windows and lots of natural light have replaced the long bowling alley shape of the last store. The outside gooseneck lights are brighter than the street lights! Angela Bing and Barbara Keogh have joined Miss Laurice and I at the store. The new Scrabble Club uniforms have epaulettes. We have a mop closet for our carpeted floor. Thanks, city regulations! 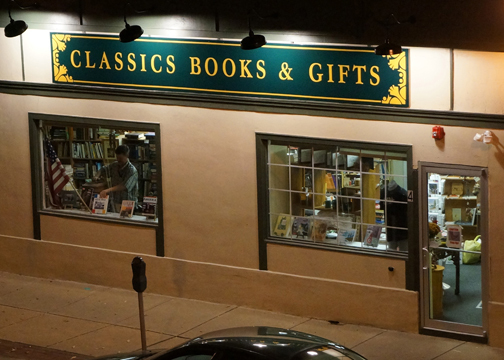 Mary Allen points out in an email that “In a comparison of the aesthetic qualities of the new residence of Classics Bookstore to its former dwelling, one of the first attributes that strikes the viewer is the increased white space of the visual scene. This block of solid color produces an undemanding visual backdrop for the geometric windows as well as a vibrant contrast to the forest green Art Nuevo nameplate. Further, the artist has generated interest and thought by utilizing a single pane window alongside a multi-pane window. This juxtaposition seems to speak to the struggles of maintaining individual identity in a modern technological society which demands the fulfillment of a surfeit of different, and sometimes conflicting roles, by the individual. All of these qualities exist in stark contrast to the former dwellings dark tones and crowded visual field which assaulted the viewer and produced an aura of burden and misery. Wait… what was the assignment? 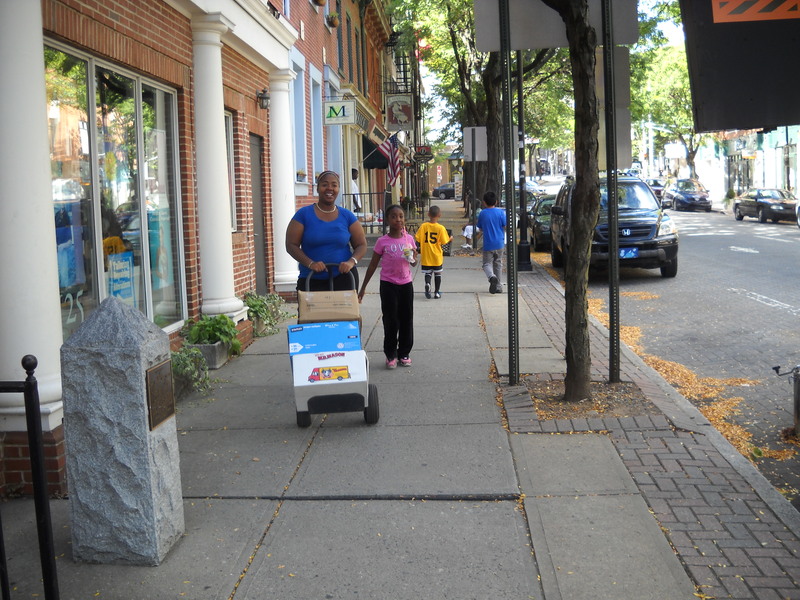 Classics Used and Rare Books moved Saturday 15th of September, 2012 to its new location at 4 West Lafayette. 35 people moved 15,000 books and 60 bookcases in 10 hours. Aside from moving bricks, moving books is the heaviest. Not as many books had fallen down behind the cases at the old store as we guessed. Don’t let anybody tell you you can’t do something (like move 15,000 books in one day). All you need are friends and a stubborn streak.